HP DeskJet 3733 All-in-One printer is a small pack with multiple functionalities including print, scan, and copy. The printer is easy to move due to its less weight of about 2.33 Kg. In addition, the printer has a low footprint with dimensions of about 141 x 403 x 177mm. It is flexible with windows and MAC operating system. The printer offers crisp in printouts and has a printing resolution of 4800 x 1200 dpi. According to the ISO standard, the printing speed is 8 ppm for black and 5.5 ppm for colour. The HP DeskJet 3733 All-in-One ink cartridges in conjunction with HP instant ink technology, can save 70% ink and get crisp and vibrant printouts. This versatile printer allows multiple media types which include A4, letter, legal, or envelope. The printing speed of the individual media may vary, depending on the media type. Also, to add flexibility, the printer permits wireless connectivity. One can easily print with mobile, Apple AirPrint, and HP ePrint. This small, snazzy, economic printer is perfect for small printing jobs. 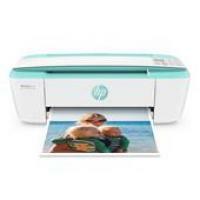 HP DeskJet 3733 All-in-One printer is one of the smallest printers compiled with many features. The printer has wired and multiple wireless connectivity options to print, scan and copy the document. Moreover, the printer allows multiple media and supports MAC and Windows operating system. The printing speed of the printer is slow but the print quality of the printer is above average. This handy, low-cost printer is suitable for the one who does not perform frequent printing. How to resolve the print issue of HP DeskJet 3733 All-in-One printer in Windows? Check for the error messages from the printer software and try to resolve them by following the instructions appearing on the screen. Most of the error messages can be resolved by our own following the on-screen instructions. If your computer is connected to the printer with a USB cable, disconnect the cable and reconnect it again. If your computer is connected to the printer with a wireless connection, confirm that the connection is working fine. Check that the printer is not paused or offline. Refer the online user manual for the detailed information. Check that the printer is set as the default printer for printing operations. Restart the print spooler. To restart the spooler, depending upon your operating system, perform the action. Refer your online manual for detailed instructions. Restart the computer and clear the print queue. When a single cartridge mode is initiated? Single cartridge mode is used to operate the printer with only one HP DeskJet 3733 All-in-One ink cartridge. This mode is initiated when one of the following occurs. Only one single cartridge is installed in the carriage. A cartridge is removed from the carriage if there are two or more cartridges installed previously. Note: If the printer enters the single cartridge mode when two HP DeskJet 3733 All-in-One ink cartridges are installed in the printer, verify that the protective piece of plastic tape has been removed from each of the cartridges. When the plastic tape covers the cartridge contacts, the printer will not able to detect that the cartridge is installed. If no plastic tape is remaining on the cartridges, try cleaning the cartridge contacts. For information about cleaning the cartridge contacts, check the user guide. In order to exit the single cartridge mode, install both the black and tri-color cartridges in the printer. Q. I previously set up my HP DeskJet 3733 All-in-One printer with my computer using a USB cable. How do I change this connection to a wireless connection? Open the printer software and click on “Tools”. Go to the “Device Setup & Software” tab. Select “Convert a USB connected printer to wireless” option. Follow the instructions prompted on your screen to continue the setup. Q. How is the quality of ink used in your compatible HP DeskJet 3733 All-in-One ink cartridges? A. We provide our users with premium compatible ink cartridges. All our ink cartridges contain high-quality ink that will deliver the best print results. You will not be disappointed when using our compatible ink cartridges with your printer. Q. How am I supposed to pay for the compatible HP DeskJet 3733 All-in-One ink cartridges that I wish to order? A. You can choose to pay for the products you order, by Laser Card, American Express, MasterCard or Visa credit card, Maestro, Switch, Solo or Delta debit card. The payments on our website are hosted by Sage Payments to ensure that your credit/debit card details are safe. A. HP DeskJet 3733 All-in-One printers measure about 403 mm in width, 451 mm in depth and 264 mm in height. They are extremely lightweight, weighing only about 2.33 kg. Q. I accidentally ordered compatible HP DeskJet 3733 All-in-One ink cartridges from your website. I have not opened the packaging. Is it possible to return these items back? A. Yes, we do accept return of non-faulty items. Please contact us within 30 days from your purchase in order to return the items. Once we receive the item, we will refund you the amount once the items are deemed fit for resale by us. Please note that, returning non-faulty items are subject to a 10% restocking fee.